**Full Refund** up to **7 days** before booking date. - **$100 deposit** is lost if **7 days or less** before the booking date. Remainder will be refunded. - **50% of Total Booking Amount** is lost if **72 hours* or less from your booking time. - **0% of the total** bill is refundable **less than 72 hrs** before the booking start time, unless for weather (see weather policy below). - **Weather:** Full Refund for INCLEMENT weather determined by ARB/Driver. - If the rental has started and weather and/or rain moves in, its at the drivers sole discretion to cancel the booking or wait out the weather until it passes. If rain lasts more than 30min during a booking then the booking can be canceled by the client or driver. Any cancellation due to weather after the booking has started will receive a prorated refund from the time they left the dock to the time they are returned to the dock, NOT when it starts raining. - **Damages** Any Damages to the boat caused by you or your guests will result in a charge for damages that can go up to $500 to the card on file. These are ANY damages to the boat through an action of **you or one of your guests** regardless of the captains instructions. If damages occur, $500 will be charged to the card. Any amount of damages less than $500 will be refunded to the card on file once damages have been assessed. Where do I get picked up for my Boat Rental? Loop 360 Boat Ramp, 5019 Capital of Texas Hwy N. This is a public state park boat ramp and they do charge a park entrance fee. Once you arrive, you will need to visit the wooden “Pay Booth” before heading to the dock. If you cannot locate us for any reason please give us or your driver a call and we can direct you in the right direction. The pay booth when you arrive at Loop 360 Boat Ramp is where you can pay $10 per car to drive in and park your car and walk towards the boat ramp/dock or there is also free parking across the street but you may be asked to pay a walk in fee of $3 per person even if you get dropped off or get an Uber. **Weather:** Full Refund for INCLEMENT weather determined by ARB/Driver. Yes you can bring anything you would like to eat or drink. We do not allow grills or cooking devices on the boat but you can bring hot food and store it in a cooler. WHERE DO WE MEET YOU AND/OR PARK? Loop 360 Boat Ramp, 5019 Capital of Texas Hwy N.
This is a public state park boat ramp and they do charge a park entrance fee. Once you arrive, you will need to visit the wooden “Pay Booth” before heading to the dock. If you cannot locate us for any reason please give us or your driver a call and we can direct you in the right direction. Pickup Locations will be arranged with your driver and online when you make your reservation. Yes you can bring your furry friend but please don't let them on their seats as their nails can tear the leather seats and any damages will be charge to the card on file. Yes we provide (2) 20 lb bags of ice and a 100 Quart cooler stocked with water bottles. There is plenty of room for your drinks, mixers, beer etc. CAN WE GO TUBING FROM A PONTOON? No we do not allow tubing from out pontoons boats, only the ski boats. DO YOU PROVIDE INFANT/KID LIFE VESTS? Yes we have kid life vests of different sizes. However, if you have one that you know fits your kid we recommend you bring it. All children under 13 must wear their life vests while on the boat. WHAT IS THERE TO DO ON LAKE AUSTIN? 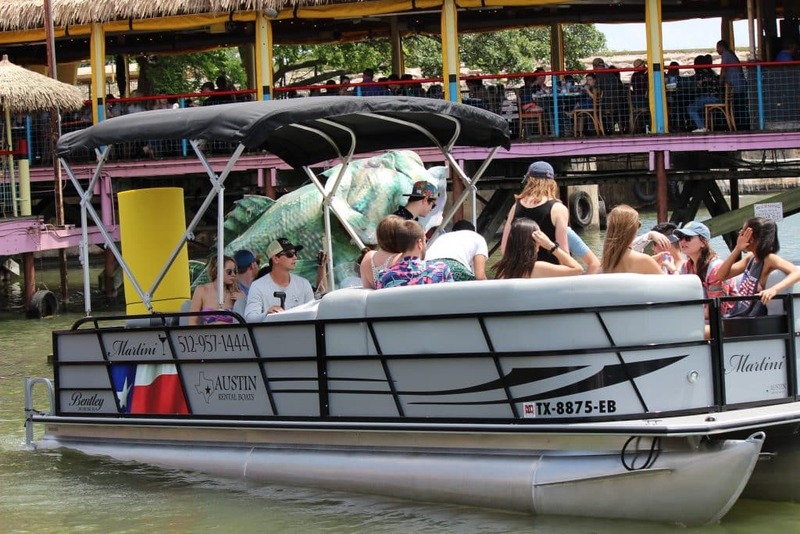 Lake Austin is a 26 mile long lake which offers a great scenic cruise. There is also a "party" cove where boats tie up together and enjoy the lake and swim. There are restaurants located on the lake such as Hula Hut, Ables on the Lake and Ski Shores. You can also stop by the rope swing located right after the 360 bridge. Yes of course! We offer 10’ layout lily pads, floating saddles, foam beer pong table, Water Volleyball net, floats for your drinks, etc all included in your rental! CAN YOU PICK US UP FROM A DIFFERENT LOCATION? Our main pickup location is the Loop 360 Bridge Boat Ramp. We can arrange to pick you up at any boat house or marina on the lake. In some instances we can allow pickups from the docks at Hula Hut/Able's on the Lake. We cannot pick-up from Walsh boat landing. CAN I LEAVE A TIP ON THE CARD? Yes, you can leave a tip for your captain on the card you used to make the booking. There is a mandatory 10% tip for any groups over 10 people that will be charged to the card on file after your booking unless a prior tip is arranged or paid to the driver. CAN WE SPLIT THE PAYMENT? We can split you payment in 2 but not more than that. CAN WE PAY WITH THE CARD ON FILE? Yes we have the ability to add the tip, more hours to your rental, or misc things you need our driver to grab to the card on file. IS THERE A GRILL ON THE BOAT? No we do not provide grills on the boat and sorry but you can't bring your own either. DO WE HAVE TO PAY FOR GAS? No gas is included in the price of the boat. IS THERE A MINIMUM # of HOURS TO BOOK? We have a 4 hour minimum depending on the day and boat. Saturdays at 3:30pm we offer 3 hour bookings. CAN WE RENT THE BOAT MULTIPLE DAYS AND LEAVE IT AT OUR LAKE HOUSE OR ON THE WATER? No, we do not allow the boats to stay on the water overnight. We will work with you to provide you a boat for the days requested. IS THERE A RADIO ON THE BOAT? Yes all our boats have radios and aux cables to plug in your own music through the boat speakers.